well that does not quite work well as the existing columns will not be changed and retain its current collation type, only the newly created objects will use this new collation type. 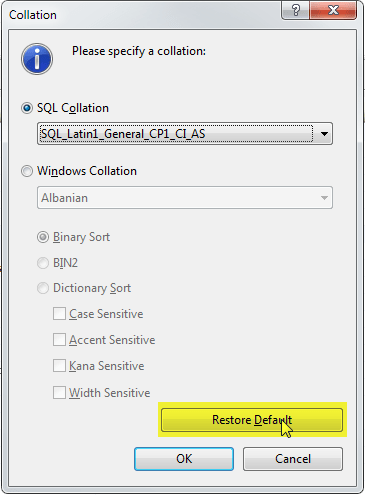 So you are left to the option of changing the columns one at a time by going to the column property and restoring it to default or choosing the collation type you want. Well that’s great if you need to change 10 columns or less but what if you want to change the whole database? What if it’s a primary key or a foreign key? Well isn’t that a nightmare? Well I will give you an easy solution and all you need to do is to run 6 easy steps. If you don’t want to recreate the database and pump data by using DTS or SSIS then this is the solution for you just make sure backup and restore everything before doing any changes. Step 1: Prepare your DB and Change the collation to your desired one. Like I had said backup your database as a part of the preparation, once that’s done change your collation to the desired type by going to the database properties by right clicking on the database and choosing properties, once your on the properties window choose options and you can see the collation from there, choose what you want then hit OK. This will ensure that new objects created will be using the new collation. Step 2: Create you Change Collation Script. If you don’t have relationships, primary keys and foreign keys then you don’t need to do the next step. I only separated the Create Indexes and Drop Indexes as we need to run a process in the middle. script that you can cut and paste to use elsewhere. characters--not enough for many cases. Now you have the two stored procedure all you have to do is to loop though all tables in you database and pass that as the parameter of the Stored Procedure. First we use the ScriptCreateTableKeys. Just make sure when you execute them output the results as text so you can easily copy and paste the results. In this order run your scripts and wait for the results, time wait might vary depending on your database size. The change collation sample is missing its variable declarations. Thanks for sharing your ideas on changing collation. I am failing at Step-1 itself as my database has check constraints and computed columns. 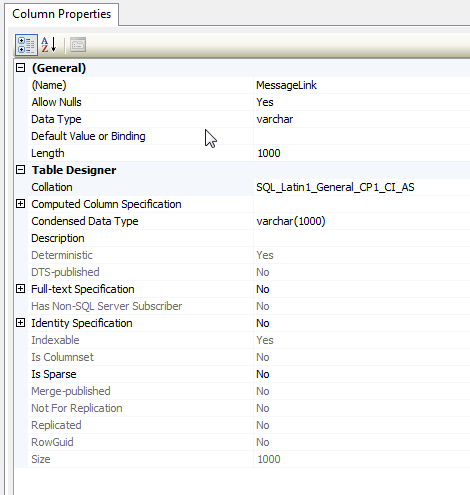 I cannot change the collation of the database from Properties dialog. I want to change the collation from ‘SQL_Latin1_General_Pref_CP1_CI_AS’ to ‘SQL_Latin1_General_CP1_CI_AS’. I am stuck at the below error(partial). All check constraints and computed columns are schema bound. The object ‘pager_phone_format’ is dependent on database collation. The database collation cannot be changed if a schema-bound object depends on it. 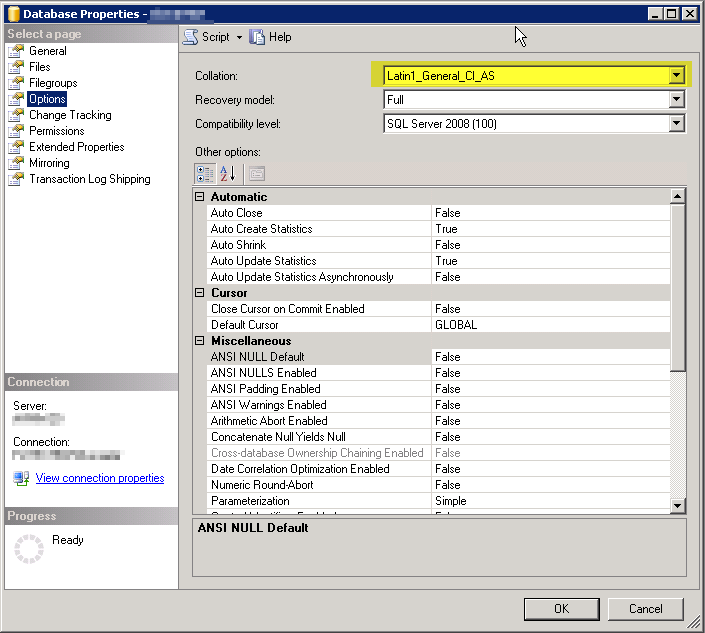 Remove the dependencies on the database collation and then retry the operation. I am looking for a script/scripts that will script out all the check constraints like the stored procs you provided for foriegn keys and also the drop scripts to remove the dependency. Was hoping if you have them already. Thanks for the reply! This is a wonderfull Post. I can’t see the link, can you send me it? Hi, nice scripts, saved mee al lot of work with a database with nearly 3000 Indexes (big DMS :o).